What is CERF and PRA and what types of eye issues are hereditary in Labradors? What is a CERF exam, and why should I not buy a puppy if the parents have not had this examination??? If you have a Labrador, I’m sure you don’t want them to go blind as early as 2-5 years old. Too many people buy puppies from non-reputable breeders and don’t even bother to ask about this certification—one of the most important ones your Labrador’s parents both need to have. And THEN…hello…you’ll be out about $10,000 in surgical fees to remove genetic cataracts if your pups’ parents have NOT been cleared for this genetic condition. Besides hips and elbow dysplasia, this is the most common defect in the Labrador Retriever breed. So…WHAT is CERF anyway? 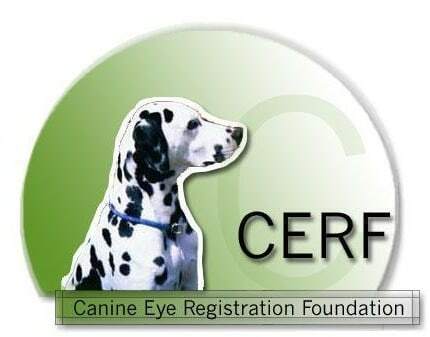 The acronym stands for Canine Eye Registration Foundation. Regarding “PRA” and the Labrador Retriever, Frances O. Smith DVM PhD Diplomate American College of Theriogenology speaks about this: “The Labrador Retriever is a breed of dog that is at risk for the development of a number of different hereditary eye diseases. One of the more devastating is a disease of the retina called PRA. In the prcd form of this disease cells in the retina degenerate and die eventually resulting in vision loss. 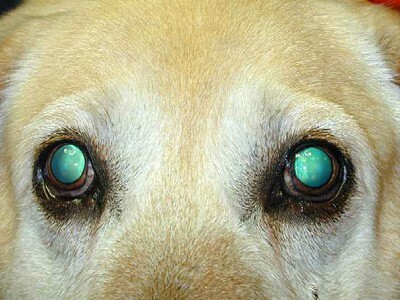 Most dogs first show signs of decreased night vision indicating that the retinal rod cells are losing function. Later in the disease, the cone cells of the retina lost their function and daytime vision is lost. There are other retinal diseases and not all PRA is this prcd form, although it is the most common form in the Labrador Retriever. The Canine Eye Registry Foundation (CERF) maintains a database of animals that have been examined by a board-certified ophthalmologist and have been found to be free of vision damaging inherited disease. These CERF examinations should first be performed by 12 weeks of age to identify early onset retinal disease such as retinal dysplasia and should be continued on an annual basis to identify ocular changes that develop at a later date. Most ophthalmologists suggest that the CERF examination be continued annually on breeding animals at least until the eighth year of life. It is known that the prcd form of PRA is a recessively inherited meaning that an affected animal inherits genes for the disease from both parents. Thus the parents of an affected dog are either carriers of the gene or affected themselves. Carriers of the disease are heterozygous for the gene (they have one normal and one abnormal gene). A normal dog is homozygous for normal genes (has two normal genes). The disease can be controlled by: (a) identifying affected dogs and eliminating them from breeding programs; (b) by identifying carrier dogs by pedigree analysis or genetic testing; ) and, (c) hopefully, by identifying normal dogs. The available genetic test for PRA in the Labrador Retriever is the Optigen test. While a valid and worthwhile test, it is not a substitute for the annual CERF examination. The Labrador Retriever Club continues to recommend annual CERF examinations in all breeding Labradors. Inclusion in the CHIC program requires examination for hips, elbow and eyes with open disclosure of the results. Additional testing is encouraged, but is not required, for a CHIC certificate to be issued. When buying a puppy or planning a breeding, it is wise to explore the CERF website. Animals that have a current eye examination with normal eyes will be listed and may be identified by either the registered name or the registration number… The health clearances recommended by the LRC, Inc. are OFA hips, OFA elbow, and a current CERF exam. If you call or email a breeder and they say, “Oh my veterinarian looked in my dog’s eyes and they are fine.” RUN AWAY! This genetic defect can only be discovered by a certified canine ophthalmologist. You can ask your local veterinarian for the nearest referral if you are thinking of breeding your Lab and need to do this very important test.